Too many Australians are currently experiencing or are at risk of homelessness. The pathways to homelessness are varied and complex, and can be shaped by a range of social, economic and personal factors, including domestic violence and family breakdown, unemployment, discrimination, mental illness and financial stress. A shortage of affordable housing is one of the key drivers of homelessness in Australia, and more needs to be done to increase the availability of social and affordable housing which is safe, suitably located and affordable. This Homelessness Week (6-13 August), the St Vincent de Paul Society is asking its supporters to get onboard the Everybody’s Home campaign by signing the petition, liking the Facebook page, or following the campaign on Twitter. Vinnies is a campaign partner of the Everybody’s Home campaign, which is supported by Australia’s leading charities and invites people to join with us for a better, fairer housing system for everyone. 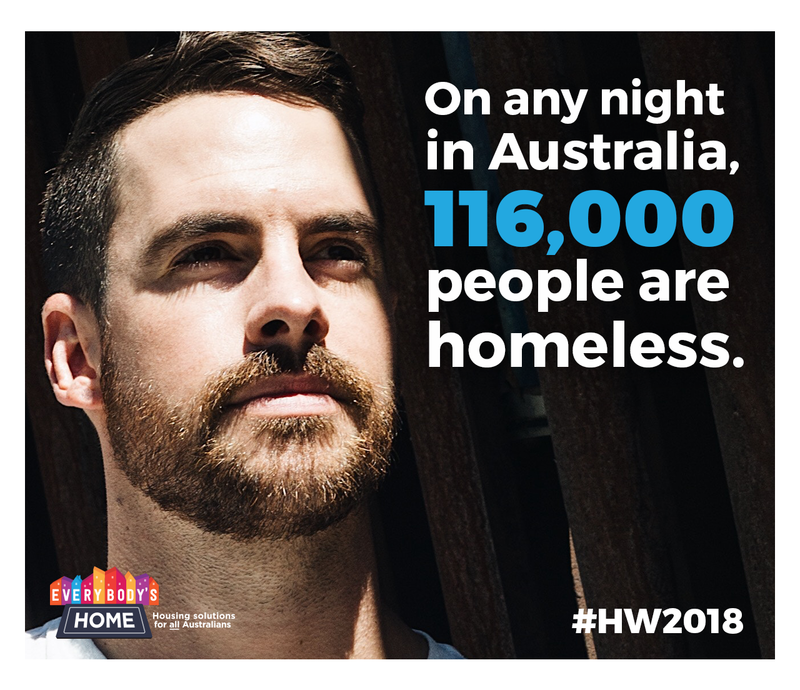 Housing is a human right, but on any given night in Australia more than 116,000 people are homeless. Australia has a shortfall of housing supply, estimated at over 500,000 rental dwellings that are both affordable and available to the lowest income households. A further 800,000 households are currently experiencing rental stress and struggling to makes ends meet, with more than 30 per cent of their income being spent on rent. At the same time, the social housing system is struggling to cope with demand, with around 200,000 households on the waiting list. Tackling housing affordability and preventing (not just managing) homelessness is possible. However, it requires political leadership, committed funding, and a willingness to work across all levels of government. The new five-year National Housing and Homelessness Agreement (NHHA) came into effect in July 2018 and while it will maintain current levels of funding, there has been no increase in real federal funding for social and affordable housing. Keeping funding at current levels is not enough to cover the costs of maintaining existing services and social housing stock, let alone increasing them. The Society’s submission to a Senate Inquiry on this topic expressed concern the new agreement allowed the Federal Government to evade its policy responsibilities for some of the key drivers of homelessness (e.g. taxation, social security, infrastructure), shifting the onus for achieving housing outcomes solely onto the states and territories. Develop a long-term strategy and national action plan to support a more co-ordinated and effective approach to preventing and reducing homelessness. Such a plan would address the drivers of homelessness (including the supply of affordable housing), rapidly rehouses people who are homeless, and provide adequate and flexible support for those needing to sustain housing. What you can do this Homelessness Week 2018? Nationally, the St Vincent de Paul Society offers more than 200 programs and services. If you are interested in volunteering with one of our services, visit the Get Involved section on our website or contact us today.